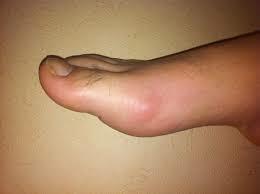 At diagnosis, Gout should be treated aggressively and promptly to target a serum uric acid level well below its crystallization concentration of 6.8 mg% at core body temperature. The conventional target is 6 mg%. However, in the cooler peripheries, and in the presence of nucleation framework (old injuries, existing tophi), precipitation may well occur at lower serum concentrations. I thus advocate 5 mg%. The lower you go, the faster you'll clear the deposits and the total body urate burden. But there are concerns, both theoretical and evidential, that, maintaining too low (below 3 mg%) a target may prove detrimental in the long run. As in all things, moderation is the better part of prudence.